Since 2008 the number of wild bee colonies has dropped precipitously. This trend should be received with alarm. A comprehensive study of this phenomenon identified seven contributing factors which operate independently and in combination. Two of those factors are human - certain pesticide use and the decimation of urban flora upon which bees "hop" to transit long distances. 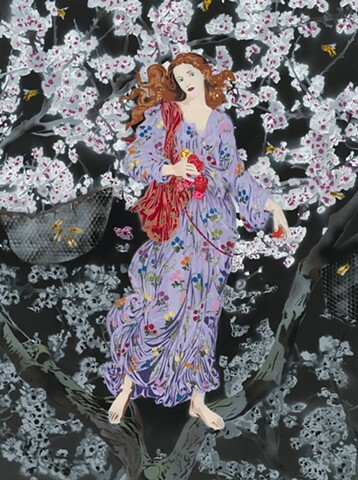 The background in this artwork is almond trees which rely heavily on bees for pollination. The central figure, aptly named Flora, was appropriated from Evelyn Pickering DeMorgan's 1894 painting of the same name. Midway in the composition are two collapsed bee colonies and, consequently, all flora and bees beneath them are dead.